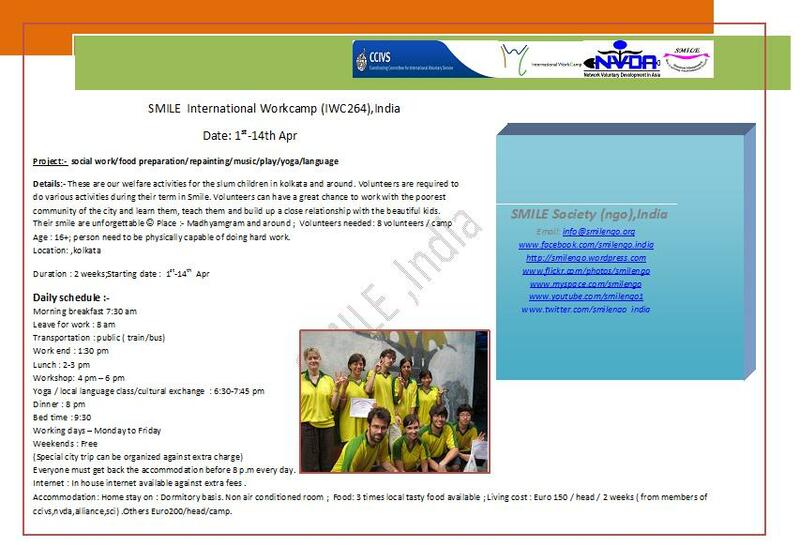 This entry was posted in volunteer placement and tagged workcamp. Age : Any ( 9-90 yrs); person need to be physically capable of doing hard work. Location: North 24 prgs, 20 km away from centre kolkata. Weekends : Free(Special city trip can be organized against extra charge)Everyone must get back the accomodation before 8 p.m every . Living cost : Euro 150 / head / 2 week applicable for the volunteers from partner organisation only, others will pay Euro 200/head/2 weeks basis. (airport pickup(one way only) ,3 times local veg. Food,shared dorm based host family accommodation, wifi available at night 8:30-10pm ( weekdays only for free),air port drop from house and car transportation to and fro project during weekdays will cost extra. Age : Any ( 9-90 yrs); person need to be physically capable of doing hard work.Location: North 24 prgs, 20 km away from centre kolkata. Group :15 volunteersAge : Any ( 9-90 yrs); person need to be physically capable of doing hard work. (airport pickup(one way only) ,3 times local veg. Food,shared dorm based host family accommodation, wifi available at night 8:30-10pm ( weekdays only, against extra cost),air port drop from house and car transportation to and fro project during weekdays will cost extra. SC2013sbr1. 5th jan. 15. Reno/ Repaint/Manual/ work shop/cultural exch. SC2013sbr2 5th feb 15. Reno/ Repaint/Manual/ work shop/cultural exch. SC2013sbr3 5th mar 15. Reno/ Repaint/Manual/ work shop/cultural exch. SC2013sbr4. 5th apr 15. Reno/ Repaint/Manual/ work shop/cultural exch. SC2013sbr5 5th may 15. Reno/ Repaint/Manual/ work shop/cultural exch. SC2013sbr6. 5th jun 15. Reno/ Repaint/Manual/ work shop/cultural exch. SC2013sbr7 5th july 15. Reno/ Repaint/Manual/ work shop/cultural exch. SC2013sbr8 5th aug 15. Reno/ Repaint/Manual/ work shop/cultural exch. SC2013sbr9. 5th sep 15. Reno/ Repaint/Manual/ work shop/cultural exch. SC2013sbr10. 5th oct 15. Reno/ Repaint/Manual/ work shop/cultural exch. SC 2013sbr 11. 5th nov 15. Reno/ Repaint/Manual/ work shop/cultural exch. SC2013sbr12 5th dec 15. Reno/ Repaint/Manual/ work shop/cultural exch. 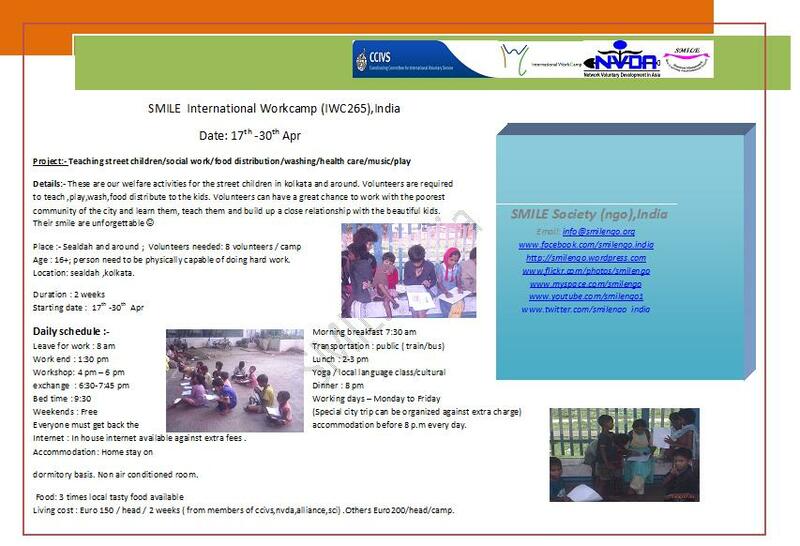 This entry was posted in student summer camp India, Uncategorized, volunteer placement.